If you're looking for a high-performance sports car in Bexar County that delivers an exhilaratingly instinctive driving experience, then look no further than the spectacular 2017 Jaguar F-TYPE in San Antonio TX. 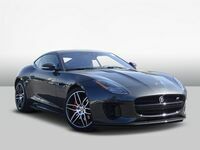 The new F-TYPE, offered in both coupe and convertible versions, is powerful, agile and utterly distinctive. Engineered for high-performance and responsive handling, the 2017 F-TYPE is a true Jaguar sports car. Whether you live in San Antonio, Boerne, Schertz, New Braunfels or anywhere else in Texas, we're confident you'll love the new F-TYPE. Come take this incredible sports car for a test drive at Barrett Jaguar! With its responsive supercharged engine, lightweight aluminum construction and sophisticated suspension, the 2017 F-TYPE is everything you'd expect out a true performance car, and much more. It offers a choice of four highly advanced engines — 3.0 liter 340 hp V6, 3.0 liter 380 hp V6, 5.0 liter 550 hp V8 and the new 5.0 liter 575 hp V8. Every one features a Roots-type twin-vortex supercharger, mounted in the "V" of the engine to preserve its compact dimensions. With both manual and automatic transmissions available, there’s an F-TYPE that suits your style perfectly. And with the F-TYPE's All-Wheel-Drive with Intelligent Driveline Dynamics (F-TYPE S AWD and R), quick response steering and Carbon Matrix Braking System (F-TYPE S Automatic transmission, R and SVR), you are in store for immense driving enjoyment. The 2017 F-TYPE's sports car heritage is revealed by its powerful shape and beautiful proportions. It is, in part, sculpted by the wind itself, formed with airflow technology. Aerodynamic performance is seamlessly integrated into the body for low levels of lift and excellent stability at high speed. 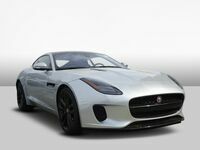 For the pure Coupe look, the aluminum roof on the F-TYPE Coupe is as strong and lightweight as the rest of the vehicle. 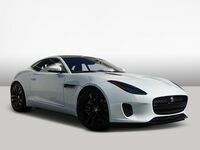 It provides the ideal complement in color, style and line to the powerful F-TYPE profile. For the F-TYPE Convertible, even the top is fast — it can be raised or lowered in just 12 seconds at speeds of up to 30 mph. 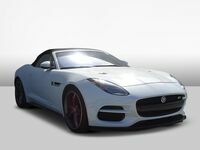 Built with composite materials designed to reduce wind and road noise, the compact and weight-saving fabric convertible top enhances the performance capabilities of the F-TYPE. The 2017 F-TYPE connects, informs and entertains in distinctive style with its state-of-the-art technology and precision built sound systems. Easily select climate control, GPS navigation, audio choices or Bluetooth telephone connectivity on the crisp color 8-inch Touch-screen in the F-TYPE center console. The all-new Jaguar InControl systems offer the latest technologies to connect you and your car to the outside world. From calls, media and navigation, to climate control and driver settings, InControl brings the latest in seamless, intuitive connectivity. Also, with Jaguar InControl Remote and Protect, you can check your fuel levels remotely, find your vehicle in a busy parking lot, record your journeys and even check that you haven’t left a window open — all through a handy smartphone app. 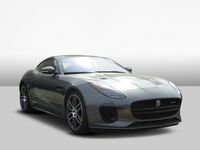 If you'd like to learn more about the 2017 F-TYPE or wish to take this phenomenal sports car for a test drive, then don't hesitate to contact us at Barrett Jaguar!